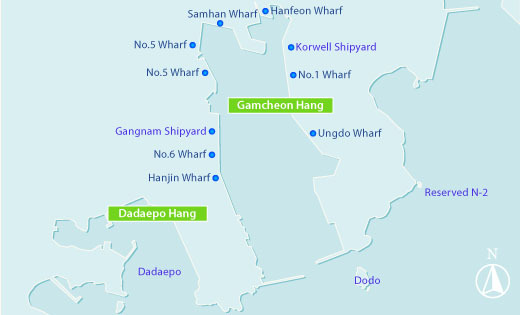 *Please contact us if you need other Korean open port information besides above. The vts is a service implemented by competent authority, designed to observe the navigation or movement of vessels in traffic lane or port and to provide any essential informations for the safety of vessel traffics. The service should have the capability to interact with the traffic and respond to traffic situations occurring in the VTS areas. The VTS area under the control on VTS system is the sea surface joining the harbour limit including N-5 anchorage and the area linking the following positions 35-04-01 N, 129-06-59 E, 35-02-42 N, 129-07-45 E, 35-04-14 N, 129-09-11 E and 35-04-31 N, 129-07-18 E.
keep listening on VHF CH12 at all timers. Busan VTS center provides the navigational warning and information on VHF Ch12. All vessels in VTS area must listen to this channel at all times. Busan VTS center provides the traffic information for navigation in Busan VTS area. Clearances will be approved or refused at the base of the information given by ships.